American and European scientists are firming up the details of an ambitious joint mission to Jupiter to explore oceans on the giant planet's icy moons. The overarching theme of the Europa Jupiter System Mission, a combined effort by NASA and the European Space Agency, will be "the emergence of habitable worlds around gas giants," the two space agencies announced Friday (Feb. 4). The proposed mission, if approved, would send orbiters to two of Jupiter's ocean-harboring moons. A NASA craft would head to Europa, while an ESA orbiter would circle the moon Ganymede, officials said. "We've reached hands across the Atlantic to define a mission to Jupiter's water worlds," said Bob Pappalardo, of NASA's Jet Propulsion Laboratory in Pasadena, Calif., in a statement. Pappalardo is the pre-project scientist for the Europa orbiter. "The Europa Jupiter System Mission will create a leap in scientific knowledge about the moons of Jupiter and their potential to harbor life." The vision of the mission has been articulated in two separate reports, one by NASA and one by ESA, officials said. The ESA report is being presented to the European public and science community this week, while NASA's was published online in December. The proposed mission singles out the icy moons Europa and Ganymede as special worlds that can lead to a broader understanding of the Jovian system and of the possibility of life in our solar system and beyond. The two moons are natural laboratories for analyzing the nature, evolution and potential habitability of icy worlds, officials said, because they are believed to present two different kinds of sub-surface oceans. NASA's Europa orbiter would characterize the relatively thin ice shell above Europa's ocean, the extent of that ocean, the materials composing its internal layers and the way some of the moon's surface features formed. A 2009 NASA report said the estimated lifetime cost of the Europa orbiter would be about $3.8 billion. The spacecraft would also identify potential sites for future landers. Instruments that could be on board include a laser altimeter, ice-penetrating radar, spectrometers that can obtain data in visible, infrared and ultraviolet radiation, and cameras with narrow- and wide-angle capabilities, officials said. Ganymede is thought to have a thicker ice shell, with its interior ocean sandwiched between ice. ESA's Ganymede orbiter would investigate this different kind of internal structure, as well as study the intrinsic magnetic field that makes Ganymede unique among the solar system's known moons, officials said. ESA's orbiter, whose instruments would also be chosen through a competitive process, could include a laser altimeter, spectrometers and cameras, plus additional fields-and-particles instruments. According to ESA's initial estimates, the Ganymede orbiter would cost about 650 million euros ($883 million). The two orbiters would also study other large Jovian moons, such as Io and Callisto, with an eye toward exploring the Jupiter system as an archetype for other gas giant planets, officials said. 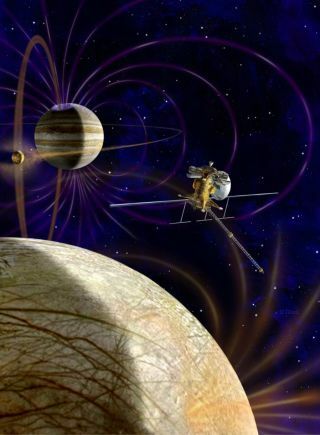 NASA and ESA officials gave the Europa Jupiter System Mission proposal priority for continued study in 2009, agreeing that it was the most technically feasible of the outer solar system flagship missions under consideration. Over the next few months, NASA officials will be analyzing the joint strategy and awaiting the outcome of the next Planetary Science Decadal Survey by the National Research Council of the U.S. National Academies, officials said. That survey will serve as a road map for NASA planetary missions for the decade beginning 2013. The Europa Jupiter System Mission could launch by 2020, with the orbiters reaching Europa and Ganymede around 2026, NASA officials have said.